The Ruhr (German: Ruhrgebiet)  is a region in North Rhine-Westphalia, Germany. The region was formed during the 20th century by Montan industry (coal and steel) and runs currently through a structural transformation which makes it to one of the most dynamic regions in Europe. Its extension is limited by the Ruhr in the south, the Lippe in the north, the Rhine in the west and the city of Hamm in the east. That makes about 100 km from west to east and about 40 km from north to south. About 5.2 million people live in the Ruhr, which after London and Paris makes it the third largest metropolitan region in Western Europe. The city of Düsseldorf is located very close to the Ruhr but is not part of it. A rural region, which was the Ruhr area till 1850, became within 50 years the heart of heavy industry of Germany. Population increases in this time by 50 times. People imigrated from everywhere in Europe, but mainly from East Prussia. Today, the Ruhr area is still a densely populated part of Germany with around 5.3 million people. In the last decades of the 20th century a structural transformation began. Most mines and steel mills were closed down, the remaining updated to the current state of the art. New key technologies are IT, research, solar energy, logistic and medicine engineering althrough about 30% of the European steel production still comes from the Ruhr. The pollution of air and water has come to an end, and the region has more parks, leasure grounds and rural districts than most visitors expect. The economic strength of the cities during the coal boom has prevented the formation of a common government for a long time. The incorporation waves in 1920 and in 1970 are associated with the decline in coal production in the smaller communities. However, fragmentation was also very politically desired. 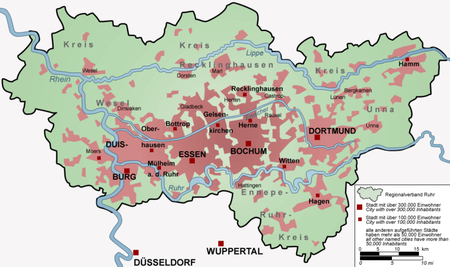 A united Ruhr Valley, it would be by far the largest city in Germany and the third largest city in Central Europe, would have a political weight which would be located undoubtedly left of the center. Still today, the fragmentation of the region inspires a lively competition between the cities. The allocation of funds to many equal deciders generated the most prominent cultural, sporting and recreational offerings in Germany, but also inhibited nationally-known prestige objects. Also it had a negative impact on public transport system. On the other hand this makes the character of the Ruhr. Despite its immense size, parts of the Ruhr do not look like a big city: regional, almost small-town, character is everywhere evident. The lack of eye level with other major cities will be disadvantageous to the cognitation from the outside, which does not meet the dynamics and the offer of culture in any way. Although, after the end of the German coal and steel boom, many companies of all kind have settled at The Ruhr Valley, unemployment here is quite high (7.7% national average, 11.5% of the Ruhr, as of July 2008). The residents of all nationalities are very down to earth, because they are involved generally in strong social networks that mitigate the worst effects of unemployment. In addition, good-quality housing in the Ruhr area is quite inexpensive. Therefore, the attendance for migration is low. Also, many of the newly created jobs are in the high-tech sector and cannot easily be filled by workers exempted from production. Do not expect that all Germans wear leather trousers. They are common only in Bavaria and, even there, only on special occasions. Germans obey (in general) the traffic rules and often become angry if others do not. Crossing the road while traffic lights are green for drivers can be dangerous. Drivers rely on you minding the rules too. Germans are not prude, so be prepared if you watch German TV. If it looks like a parking spot is quite small, look for a bigger one before you touch another car when parking. There are not many public toilets. If you need one, try a snack bar or a restaurant. Also, big shopping malls have a customer toilet. Not recommended are the toilets of the fast food chains. They are often badly serviced. Casual dress in the streets is generally accepted and in most restaurants. Smoking is forbidden in public buildings as well as in bars and restaurants, unless the owner has set up a separate smoking room. You may drink water from the tap everywhere. It is always of best quality. The main rule about the central European climate is that you cannot predict the weather. Sometimes summers can be cold and wet, while April (most years very rainy) is warm and sunny. But in general the best chance for sun will be from May to August and in October. July and August can become very hot with temperatures up to 35 degrees Celsius. In wintertime, from December to February, the average temperature is about zero. Winter is not generally recommended for travelling to the Ruhr area, but on the other hand in December, Germany's famous Christmas markets take place. The Christmas markets in Dortmund and Münster are definitely worth a visit. The pronounced Ruhr dialect of the 20th century is generally disliked and hardly spoken. The openness of the people of the region is shaping now a new dialect, which was enriched by linguistic and grammatical elements of its immigrants from 167 nations. Only some people understand English. You will have fewer problems if you are able to communicate in German. Communication in English is possible if you ask the next person if the first one does not understand you. In some areas, you will find a lot of people able to talk Turkish, Polish or Russian. Other languages are not very common. Düsseldorf has excellent highway connections. By car, you can be inside the Ruhr Area in about 15 minutes. Or take the train. The airport has two stations. Take the S-Bahn from the terminal station to Düsseldorf main station and from there the Regional-Express towards Duisburg. Or use the overhead railway 'Skytrain' to get to long-distance station (about five minutes) and from there the Regional-Express towards Duisburg. For early morning departures, a direct RegionalExpress train runs from the Ruhr area to Düsseldorf Flughafen Terminal station. Airport Dortmund (DTM) Shuttle buses to Dortmund main railway station and Holzwickede railway station. Public transport buses towards Unna and Dortmund-Aplerbeck Stadtbahn station. The cities of Duisburg, Mühlheim (note that not all trains stop here), Essen, Bochum, Dortmund and Hamm are situated on the main south-north route and are therefore often served by long-distance trains. From there, there is a sufficient network of commuter trains and subways into other cities in the Ruhr. Highways lead to the Ruhr from all directions. In the north-south direction, the A1 (Hamburg-Cologne) leads through the eastern Ruhr area. The A3 (Arnhem-Cologne-Frankfurt) opens to the west part and Oberhausen and Duisburg. In east-west direction, the A2 (Oberhausen-Hannover) runs through the northern part of the Ruhr. The central and southern area around Duisburg, Essen and Dortmund is accessible from the A40 (Ruhrschnellweg). East of Dortmund, the A40 changes its name to A44. Directly from the north, crossing the Münsterland, the A31 leads to the center of the region, from the south the A45 (Sauerland line) leads the Ruhr.There are numerous other highways which run through the different regions of the Ruhr. In general inside the big cities public transport is well developed and faster than going by car. But outside the car is often the better choice. Since most cities have their separate transport association, coordination is not always the best. But they are all linked together including trains like S-Bahn and Regionals-Express by Verkehrsverbund Rhein Ruhr (VRR) and Tarifraum Münsterland/Ruhr-Lippe (VRL) at the eastern limits. Look for tarifs and timetables there. Within a city use bus, tram or underground. Many lines cross city limits several times during their route, this is common and should not be considered alarming. Since most cities in the region blend into one another, traveling across cities is possible but slow. However riding a bus or tram can give you insights you will get nowhere else. If you are short on time, use the S-Bahn or Regional-Express. These are trains, and you will have to get to the nearest station. They all have the same pricing system so that the tickets are valid for all vehicles within the borderlines of the VRR on one hand and VRL on the other hand. For change from VRR to VRL and vice versa exists special conditions. Refer to the internet sites or contact one of the information offices of the organisations. Generally, onesingle tickets are quite expensive, usually cheaper are day tickets, group tickets, family tickets or for longer stays, tickets with a monthly pass. There are 5 fare levels. As a rule of thumb: if you travel 3-4 bus stops or 1.5 km (different rules for each city) you need level K, for travelling within one city or two adjacent suburbs you need level A, for a ride to the next neighbour city fare level B is needed, if you transit to a neighbour city of a neighbour city use level C, and level D is for rides to any location within the area of VRR. You can obtain tickets from the customer offices of the local transport association, from the ticket-machines at the subway stations, from ticket machines within the trams, from bus drivers and from designated kiosks. The surface of the ticket machines can be switched to several languages, english is always among them. If there is a ticket machine at a station, it is usually not possible to buy a ticket within the vehicle. Even if you just enter the platforms of a subway station without holding a valid (stamped) ticket, you may be fined. Tickets are rarely checked on platforms. Since tickets are not stamped when bought, you have to do it by yourself before entering a vehicle. The orange stamp boxes are located at the entrance of the platforms of subway and trains and within trams and busses. If you depart from a station without being able to buy tickets and without a ticket machine onboard the train, you need to ask the conductor or, if there is none, the driver what to do. Going by taxi is quite expensive. Calculate a price of about 1.60€/km plus a onetime charge from the approach. The sometimes very long distances let rise the idea to head for the desired goals by car. You can do so, the road network is consistently good, the orientation due to the numerous places and highways difficult. Avoid the rush hour, which is not so shaped as you might be expect by experience with other cities but more extended to the early morning and late afternoon. All highways are very prone to traffic jam. This is particularly true for the A1 around Dortmund, the A3 between Dusseldorf and Oberhausen, the A40 along the entire length between Duisburg and Dortmund, the A42 between Oberhausen and Herne and the A43, between Bochum and Recklinghausen. By 2010, the A40, between Bochum and Gelsenkirchen will be expanded, which means additional risk of traffic jam. But this highway should be avoided anyway. The better alternative is the A2 or change to bus and train. Only the major traffic jams will be reported during rush hours in the radio program of WDR, information about all jams is available on medium wave 720 KHz. Those who are familiar with the road network can avoid some congestion. Jam forecasts for the next hour with great accuracy is available from road NRW. There, long-term forecasts as well as a travel time calculator are offered, which is very useful for travel planning. Parking garages you will find in adequate number inside the cities, but mind the opening hours. Some close at late evening. The Ruhr is not a good spot for cyclists. In the northern part, the situation is perhaps a little better because of the spirit of the Münsterland region nearby than in the southern part, which is quite mountainous. But there are exceptions. The Ruhr Regional Association is buying disused industrial railway lines and converts them to cycle paths. If your target is beside such trails the bike is an opportunity on fine days. But remember, even the core of the Ruhr is 50 km long and the sights are spread over the entire area, in contrast to classical capitals. A list of routes can be found at item “sport”. Dahlhauser Heide in Bochum-Hordel: certainly the showcase mine of Krupp needed a adequate settlements for its workers. The settlement Dahlhauser Heide, the name was given by a former estate, was built from 1907 to 1915 in a style of a garden city. Dump Haniel in Bottrop is with its 160 m one of the highest dumps. The peak bears a crux made by guide rails, which is the end of a Via Dolorosa. Elements of mining technology form the 15 stations of the Via Dolorosa, copper plates designed by the artist Tisa von Schulenburg - also known as nun Paula - connect to religios topics and the Good Friday procession here in industrial surrounding has a long tradition. Also beneath the peak you will find a amphitheater with 800 seats, called the Mountain Arena. It is stage for some theater-plays and events. And last not least the dump bears an installation of the spanish sculptor Agustin Ibarrola. Its name is „Totems“ and it consists of 100 railroad ties. It forms a link between the industrial ambiente and nature. The Dump of Mine Prosper in Bottrop, about 90 m, with the Tetraeder, a accessable framework of steel tubes of 60 m high. Here you can experience whether you a really free from giddiness. But from top the panorama is grand. At nighttime the Tetraeder is illuminated and forms a visible landmark. Hoppenbruch in Herten, has a level of 70 m. This dump is opened for public since many years, its trees and vegetation are rown up to goody hight. So you can walk on fine tracks or small pathes to the peak, which are two of them. On the northern one you will find a windmill and a lot of plates giving some information about wind. Also mountain bikers like this dump for training. Location: map. Hoheward in Herten has with 150 m a respectable level. It is situated right hand to Hoppenbruch, together they form the most extended dump scenery in Europ. The eastern part is opend for public. The plateau bears the season observation plant. As of January 2010, the plateau is accessible, but not open to the public. Even without the observatory there is a stagering view of the surrounding cities. They also plan to build a open air stage with catering in 2009. And they think about the realisation of a "sky lake". The Chinese Garden  in Bochum is the only one in south chinese style. It is situated inside the botanic garden of the Ruhr University. Open (April–September) 9:00-18:00, (October-March)9:00-16:00, free. Maximilianpark in Hamm, leisure park on the ground of former mine Maximilian. Its highlight the the butterfly house and the glass elephant which has been built onto the disused coal washery. The central electric powerhouse and the washrooms are now a stage for a wide range of cultural activities and shows. Musical Starlight Express  in Bochum is amoung the most successful musicals worldwide. Visit Colosseum Theatre  in Essen. It is a former production hall with an wonderful industrial ambiente. The play and concert festival Ruhr Triennale  offers a wide range of events spread all over the region. Every year at the first weekend of summer schoolout starts Bochum Total . For 4 days the city turns into a stage for rock music. In May the Ruhr Marathon  takes place with about 20.000 athletes and 100.000 viewers. You must have seen it. Football/soccer is the most popular sport in the region. Every town has several pitches and in the summer there are few grassy areas not used for playing. The Ruhr also has several professional football teams, creating at times an intense rivalry. The most intense is between supporters of Borussia Dortmund and Schalke 04. As a rule of thumb you should avoid wearing football jersies in blue and white in Dortmund and yellow and black in Gelsenkirchen. The rivalry between these two teams rarely turns into violence, but the atmosphere can get a bit hostile, especially if you don't understand the people. Bochum, Oberhausen and Duisburg also have professional teams, but these are considered non-contenders by supporters of the two big teams. Matchdays are between Friday and Sunday and can lead to heavy traffic at the roads and public transport. You should behave like the locals and avoid the playing cities on match day unless you have tickets for the match. Excellent conditions for cycling offer the Ruhrtalradweg  with a length of about 230 kilometers through rural regions, the Emscher Radweg leads 225 km beside river Emscher and Rhein-Herne-Canal through industrial panorama. For short trips Lake Kemnade and Lake Baldeney (not at the weekend) as well as the Ore-Route (Erzbahntrasse - without any crossing) from Bochum Westpark to river Emscher with connection (from October 2008) to Emscher-Route and Kray-Wanner-Route (5 street-crossings) from Colliery Zollverein towards to the city of Wanne-Eickel with connection to Ore-Route. Both routes offer an excellent view on industry surroundings, settlements and suburbs. Inline scating you can do very well around Lake Kemnade (910 km) at the southern limits of Bochum and Lake Baldeney (16 km) at the southern limits of Essen. But avoid to visit this locations at the weekend - it will be too crowded. Characteristic for the Ruhr are lots of kiosks in the suburbs, smallest shops for nearly erverything. Opened mainly from afternoon till late night they act also as a communication spot for the neighborhood. Popular shopping centers are Centro  at Oberhausen, Rhein-Ruhr-Zentrum  at Mülheim, Limbecker Platz  in Essen and Ruhr Park Bochum . But the centers of the major cities offer also best shopping conditions. The traditional Ruhr cuisine has died out. Today it is mainly an international cuisine with influences from Westphalia and Rhineland as well as from the mediterranian cuisine. Since a high percentage of the population has a migration background and germans like to taste foreign food you will find a lot of foreign restaurants. Most of all Italian, Greek or Chineses restaurants, but there are also Spanish, Portuguese, Turkish, Egyptian, Arabic, Mongolian, Russian, Indian and Japonese restaurants. All those who like pancake should visit a 'Pfannkuchenhaus'. There is a wide variation of covering: you can get them sweet or with bacon, meat or vegetables. Takeaway bars can be found everywhere. The most common fast food is Pizza, Döner as well as chips and fried sausage. The traditional drink is Pils, simply called beer. Not so long ago, the region had the highest density of brewing houses in Germany. The decline of heavy industry followed a decline of breweries. Local breweries are still Fiege from Bochum, Stauder from Essen and König Pilsener from Duisburg. An excellent beer from a smaller brewing house with smooth taste is 'Borbecker Dampfbier', but it is not available everywhere; the same applies to 'Rüttenscheider' which you will only get in Rüttenscheid (a suburb of Essen). Of course you can also get non-local beers in most bars and restaurants. Recently, lots of cocktail bars opened in the region, especially in the cities of the bigger towns. Many restaurants also offer a huge variety of wines. In the last years, there has been a tendency to drink German white wine, but grape varietys from all over the world are also common. The cities within the Ruhr area are amoung the safest in Germany. Since the Ruhr area has fewer tourists than the rest of Germany, it is not in the focus of pickpockets. Still, it is a good idea to take the usual precautions. Never leave your camera unattended or flash around a fat wallet. Since many citizens are from elsewhere anyway, strangers are widely accepted, and you are unlikley to encounter racism or other prejudices. Because of unemployment and the demise of the German social system, beggars and bottle collectors are becoming rather common, but they are usually harmless. This page was last edited on 18 March 2016, at 13:16.